We know, we know: Santa is a magical personification of the Christmas spirit, the power of belief and childlike hope, and humanity’s capacity for charity and love. He isn’t subject to the natural laws of mere mortals. He probably has, like, time magic or something. But what if he doesn’t? Look, we here at Storage Direct are big logistics nerds. We’ve seen so many moves, some masterful, some… not so much. 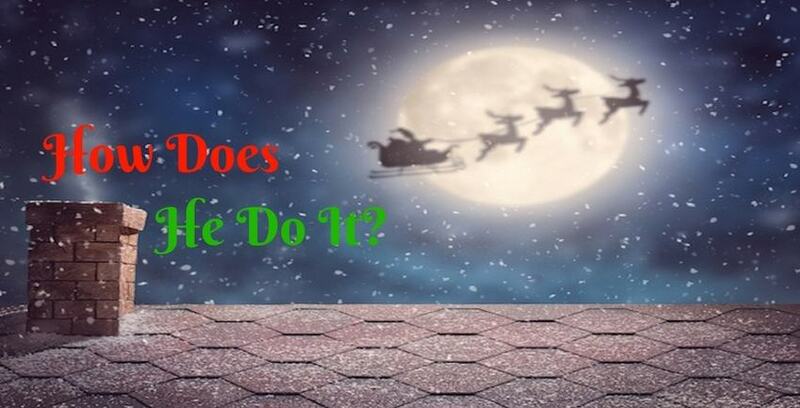 So, we started thinking: what does Santa do to get those gifts to all those good little boys and girls? How could he possibly do it? Well, after careful research and investigation (and a little eggnog), we’ve got a couple theories. These are all purely speculative. We’re not saying a certain jolly, bearded man is a regular customer at some of our units. We’re not saying that. We’re sworn to protect our client’s identities. He made us swear a “Christmas Oath.” We don’t know what that is, but it sounds serious. There was a very intimidating elf with a large candy cane standing behind us when we agreed to it. Well, Christmas Oath notwithstanding, here are our mortal theories as to how everyone’s favorite home invader pulls off his Christmas hijinks year after year. Hear us out: what if Santa Claus has hidden workshops all over the world. He converts anything–old auto body shops, used bookstores, cabins, bowling alleys–and makes people “forget” them with a pinch of the ol’ Christmas magic. Then, he mans them with a skeleton crew of elves, animated snowmen, and other Christmas helpers. These hidden workshops provide local engineering and manufacturing support to supplement the main workshop up north. This could even be the career path for elves: you start on the product line, work your way up to supervisor, and before you know it you’ve living it up in Venezuela with a shop of your own. Wearing an adorable little Hawaiian shirt. Awww! Ever notice how no one ever actually sees Santa deliver the presents? You might think this isn’t “in the spirit,” and you could be right, but what if Santa himself doesn’t hit every house? Maybe Santa is a kind of “Christmas manager.” Before Showtime, Santa makes the rounds to each of his hidden workshops and, with the help of his genius elves, lays out the most effective possible route in which to hit the houses in that particular region. Then, on the Big Night, when Santa arrives at each region, he coordinates the elves in that workshop as they follow the plan. He assists, of course, but he also monitors progress from his sleigh. Santa’s organizational mastery is such that he knows exactly how much time he has left and how fast he and his helpers have to go to keep to schedule. Santa makes sure to keep track of which houses he personally visits each year, and makes sure he hits every house in the neighborhood personally, eventually. Don’t feel too bad if you get a helper instead of the man himself. We heard (and you didn’t hear this from us) that the elves are actually a liiiiittle more generous with present distribution than even St. Nick. Have you ever seen The Manchurian Candidate? Of course you have; that movie rules. Anyway, what if Santa didn’t just use his assorted Christmas helpers? What if he had some more mundane assistance? What if there were men and women all over the world secretly assuming the mantle of Father Christmas every year? We know what you’re thinking: no one can keep a secret that juicy! Well, what if we told they did all of this while visions of sugar plums danced in their heads? With Project S.A.N.T.A., it’s possible. Sleeper Agents Nominated To Assist is a program developed during the Cold War, when Santa was having trouble moving through monitored airspace. Every year he visits carefully vetted candidates in the night and asks for their help. Here’s the deal: if they agree to become their town’s Santa (consent is always essential), Kris Kringle will use his holiday magic to subtly alter their memories. In the morning, they forget they agreed to the deal. Then, every Christmas Eve when they fall asleep, the sleeper agents enter a pleasant Christmas trance. While under this trance, the S.A.N.T.A. spring into action. Moving with superhuman coordination and agility, the S.A.N.T.A. deliver presents with a speed and efficiency to rival Santa Prime himself! Santa’s magical present bag is big, alright, but it isn’t that big. He can’t really haul every present he’s delivering in one trip. The poor reindeer! Instead, we’re thinking he has dead drops hidden all over the world. These inconspicuous locales secretly store presents all year-round. These hidden caches must be secure so no prying eyes can sneak early peeks at this year’s score. As toys are completed, Santa has his helper’s ship them off to these dead drops all year. The local workshops have delivery schedules of their own to maintain, of course, and are also responsible for making sure all product is where it needs to be come showtime. Now, we have to stress again, we’re not saying Santa Claus uses our storage facilities to store his presents. We’re not saying that. We’re just saying, if you had to do it, our units would be a pretty darn good place to. That’s all. You just couldn’t ask for a safer place to keep them, is what we mean. That’s all we can tell you without breaking the sacred Christmas oath. By utilizing any or all of these different techniques, Santa expertly coordinates successful holidays year after year. We’ll probably never know for sure how he does it. But we’ll keeping looking. Oh yes. If you want to take a page out of ol’ St. Nick’s book this year, consider looking into our short-term storage options. We have the right facility size, amenities, and rental periods for you, and we guarantee your gifts will be safe with us. More importantly, they’ll be hidden away from prying eyes. If you happen to see a large, kind-looking man in a red jacket while you’re on-site, let him be. He’s not up to anything whimsical or holiday-related. Probably. Happy Holidays!